The list of reasons why I love Portugal is long… very long. I could tell you about the goodwill of the people—definitely towards the top of my list. How excited they get when they recognize a genuine interest from a visitor about their country. How they’re always ready to set the table with the best they have to offer and try really hard to understand you—even if only through smiles and gestures. I could tell you about the landscape and architecture. How much you can experience without having to travel terrible distances, enjoying extreme diversity from one place to the next in a country about the size of the state of Indiana. I could focus on the weather, mostly sunny throughout the year with nearly 300 days of sun in most places. All of these reasons, and more, add up to why I love Portugal. But I’ll fess up to my unrelenting gluttony, and tell you that what’s at the VERY TOP of my list is Portuguese food! Not only because of the fusion of flavors you can enjoy due to the influence of Portuguese maritime discoveries and colonial-era ties on its Mediterranean foundation, but most importantly, how integral delicious and nourishing food is to the fabric of Portuguese life. Food in Portugal is a cause for celebration. But you need to know what to eat in Portugal to celebrate properly. During the warmer months, the breeze is seasoned with an oceanic smokiness that lures crowds to local joints serving up grilled sardines atop a bit of bread. There’s wine, sangria and bowls of Caldo Verde (kale soup), too. “Há Caracóis” (We have snails) signs entice passersby to stop, linger and lounge at esplanades, slurping the tasty slugs out of their shells. Before you know it, cherry season bursts into action and beautifies roadside vendors’ carts with their deep, seductive red and festivals in honor of the dainty fruit ensue. Crisp weather ushers in nights of bonfires and roasted chestnuts washed down with Aguardente (fire water), bean soups and hearty smoked sausage stews, stuffed breads and brick oven roasts. The food culture in Portugal is so powerful that breaking a Guinness World Record with a gigantic pot of snails is absolutely normal. There are museums dedicated solely to food—cheese, bread, olive oil, cherries, beer, wine and so on. It’s indeed a food lover’s paradise! What’s the downfall? Withdrawal—when you leave. 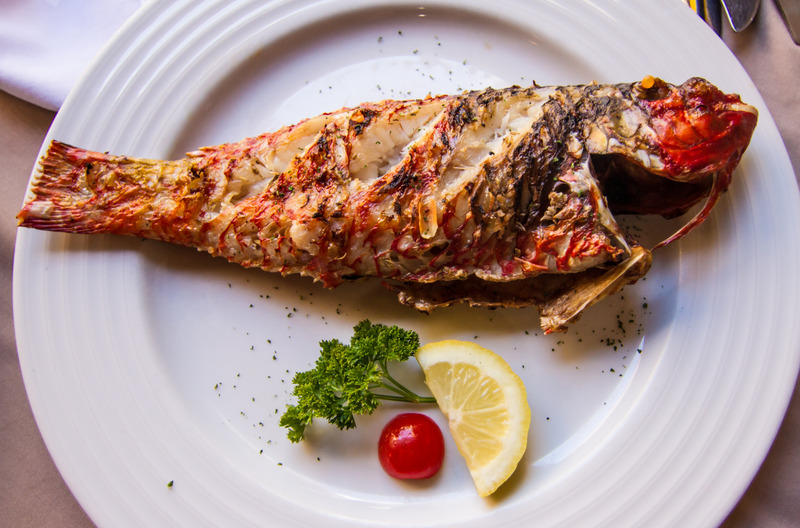 Eating grilled fish in Portugal is not merely a meal, it’s an experience! From the bustling cities to the tiniest of fishing villages, you’ll come across the ever-ubiquitous refrigerated display case featuring a feast of fish, primarily whole, for your selection. And when it comes to grilled fish in Portugal, whole is the way to go! When the fish, coated with coarse salt, hits the coal-fueled grill magic happens. Don’t discard the charred skin, or hardly anything for that matter; some of the tastiest flesh is in the nooks and crannies of the fish. Mixed with drizzles of olive oil, the crinkly skin is like fish candy! Some of my favorites include Robalo (European Bass), Dourada (Gilthead Bream), Pargo (Red Snapper), Carapau (Mackerel) and the almighty Sardinha (Sardines) *More on sardines next. One of my go-to places for grilled fish is the fishermen town of Setubal, across the bridge from Lisbon. The main drag, Avenida Luisa Todi, is lined with rows of restaurants offering fantastic choices. Cross over and walk along the water, and more options abound—my spot is Tasca da Fatinha where the griller (assador) and owner is also a fisherman. In the book O Melhor Peixe do Mundo (The Best Fish in the World), the author explains that Portugal’s fish is the best in part because of the country’s ideal oceanic conditions as well as the preservation of artisanal fishing methods. 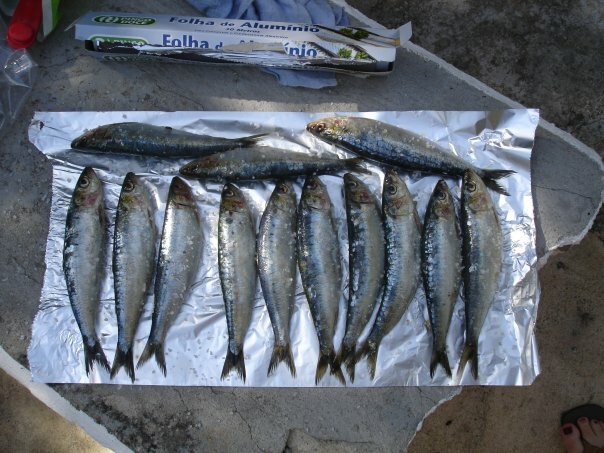 Though grilled fish is in general beloved by the Portuguese, sardines definitely reign supreme. They’re affordable and extremely tasty. They’re also easy to nibble on atop a thick slice of bread, utensil-free. In June, during the saints feasts—the grandest in Lisbon and Porto—restaurants and locals set up their coal-fired grills to serve up meaty sardines that are at their peak that time of year. In addition to bread, it’s also common to order a salad of grill-seared bell peppers, chunky tomato slices, onion and lettuce topped with olive oil, vinegar and coarse salt. This laidback meal is generally washed down with jugs of wine (red and white) or sangria (stick to wine on feast nights; the sangria for the masses tends to be watered down). Sardines are such a staple of the culture (also popular in cans) that like the iconic Barcelos rooster, there are knick-knacks, magnets and the like in the shape of sardines for sale—a quirky souvenir. One of the most decadent sandwiches you’ll ever eat is the Bifana, a thinly-sliced pork cutlet marinated in a garlic and white wine mixture and fried in a lardy sauce, then slapped in between a Portuguese roll. My mouth is watering as I write … There are places that lightly lay the butterflied bread roll on the bubbling sauce before packing the pork in there. Honestly, the sauce-soaked bread alone could satisfy me (Portuguese sauces have that effect!). 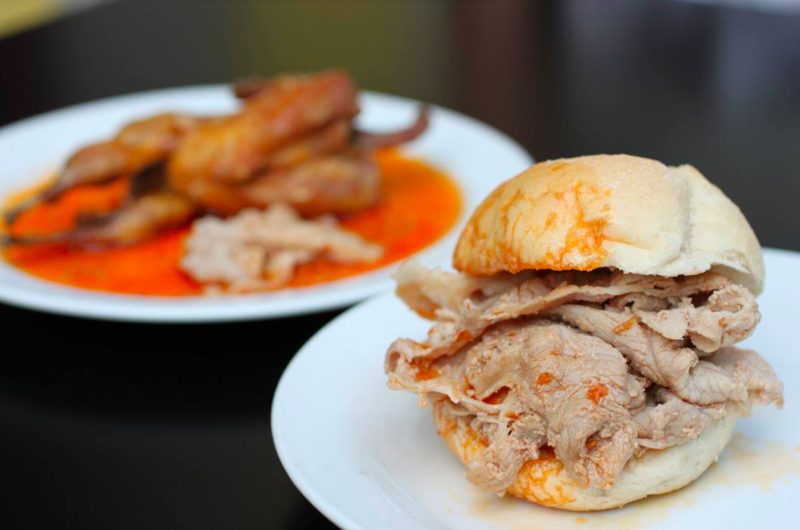 You can find mouthwatering bifanas throughout the country, but many will argue in favor of making a pork pilgrimage to the hole-in-the-wall stops in Vendas Novas. The best I ever had were definitely there–so good, I had four! (Wasn’t kidding about the gluttony …) The cutlets were paper thin, which allowed the sopped bread to play a part. Located in southern Portugal, Vendas Novas hosts an annual bifanas festival in homage to its porky delights. In Lisbon, Café Beira Gare across from the Rossio train station also offers up juicy bifanas amid other quick bites, such as Salgados, a category of savory fritters that includes one of my favorites—the half-moon shaped Rissole, stuffed with meat, chicken or shrimp. 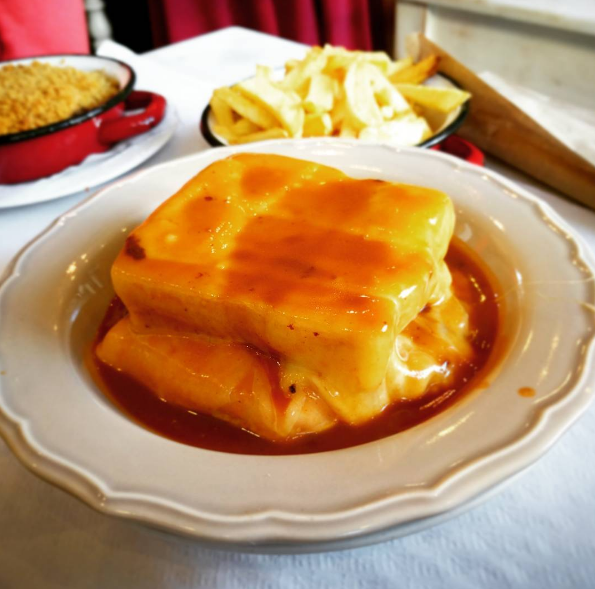 Just when you thought sandwiches in Portugal couldn’t get any more fantastic—here comes the Francesinha, a Porto institution. With slight similarities to the croque-monsieur, it’s believed the Francesinha (little Frenchie) was created by a Portuguese emigrant upon his return to Porto from France. A regular on best international sandwich lists, the Francesinha is a glutton’s dream. A variation of ham, Linguica and fresh sausage are layered in between two thick slices of bread and topped with melted cheese. The sandwich is nestled in a tangy beer sauce, and sometimes topped with a fried egg. Versions vary from restaurant to restaurant, which all keep their beer sauce and special touch secret. Some also get creative with seafood and other ingredients. My introduction to the Francesinha was at Capa Negra, after a jaw-dropping boat tour down the Douro River—a trip that opened up our appetites big time. The European soccer championships were in full speed that year, and we caught a match while chomping on our monstrous masterpieces—the Francesinha turned out to be the perfect game food! One of my favorite appetizers in Portugal is Amêijoas à Bolhao Pato. 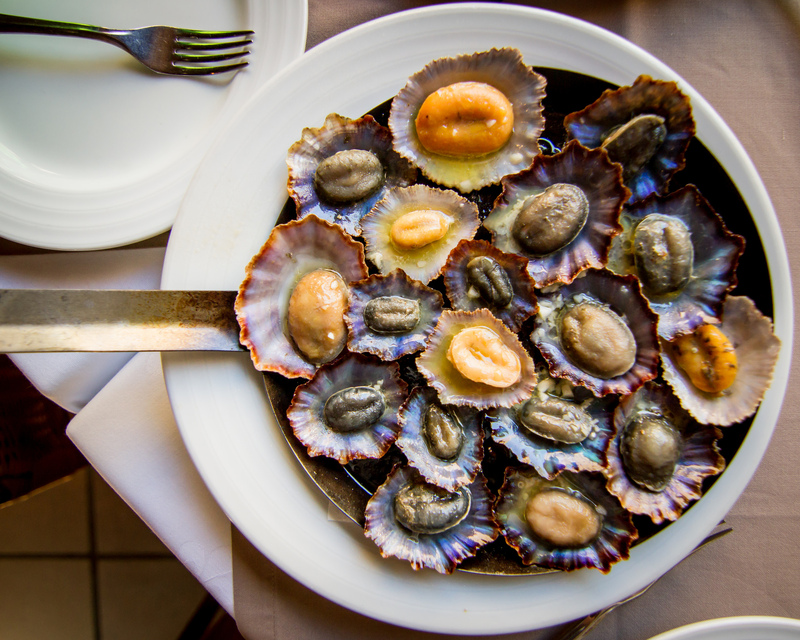 Like Portuguese fish, there are claims that Portugal has the best clams (safe to say sea creatures in general are excellent in Portugal). Whether these claims are valid or not, I can assure you the clams in Portugal are so damn delicious. And though you can’t go wrong at most places, the batch at Pinoquio in Lisbon rocks my world. At first glance, I thought this place might be a tourist trap because it’s located in busy Rossio Square and not too far from the restaurant row, Portas de Santo Antao, which with the exception of a few restaurants is indeed a tourist trap. But Pinoquio proved to be a pleasant surprise. Their amêijoas are submerged in a thick olive oil sauce and served in a STEAMING pot that the waiter rushes out with a pot holder on the handle and another in place of a lid. Sopping up bread in this sauce is orgasmic! Though I enjoy Pinoquio’s version, sometimes I’m up for a lighter sauce that allows the briny integrity of these flavorsome mollusks to be the highlight. Lisbon’s Cervejaria Ramiro delivers and so does O Velho e o Mar in Sesimbra, a fishing town in Setubal district, also a terrific spot for grilled fish. 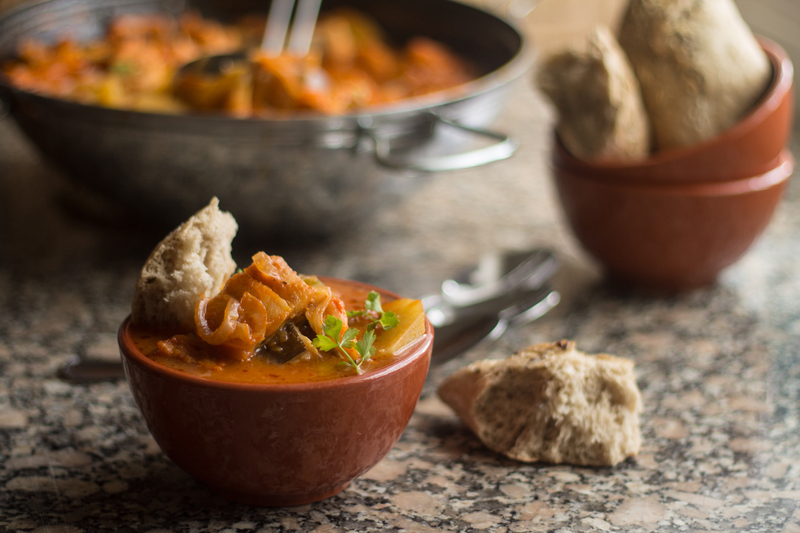 Originally a rural, peasant dish popularized in the Alentejo region of southern Portugal, Açorda is a country bread-based stew. 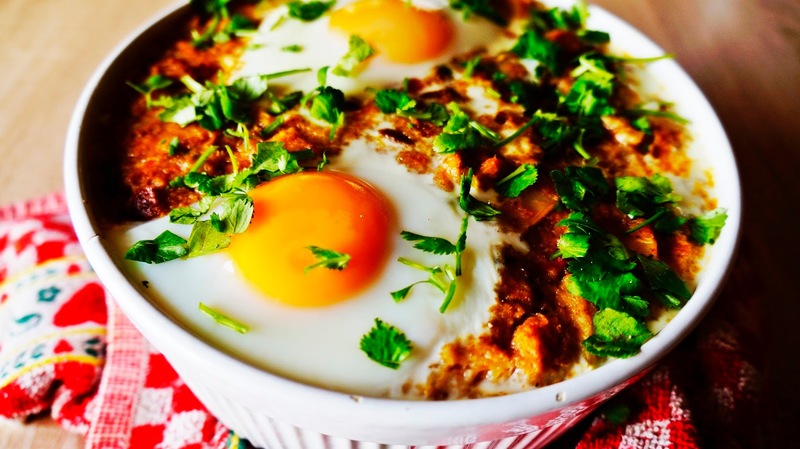 Soaked bread is simmered in a sauté of olive oil and garlic and finished with eggs and cilantro (recipes may vary according to region). 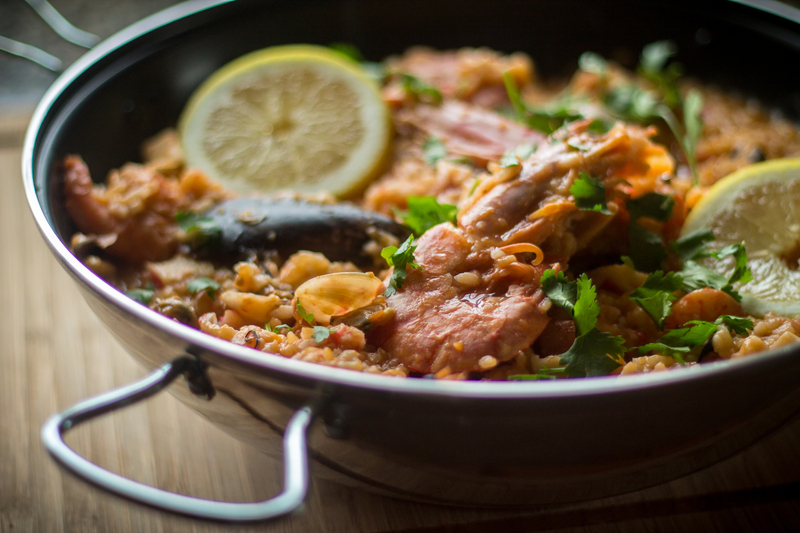 The Acorda de Marisco, my favorite, features a medley of shellfish. I have had some seriously good Acorda de Marisco at Pinoquio in Lisbon, but moving farther south on this one along coastal Alentejo (check out the Rota Vicentina) would be the way to go. 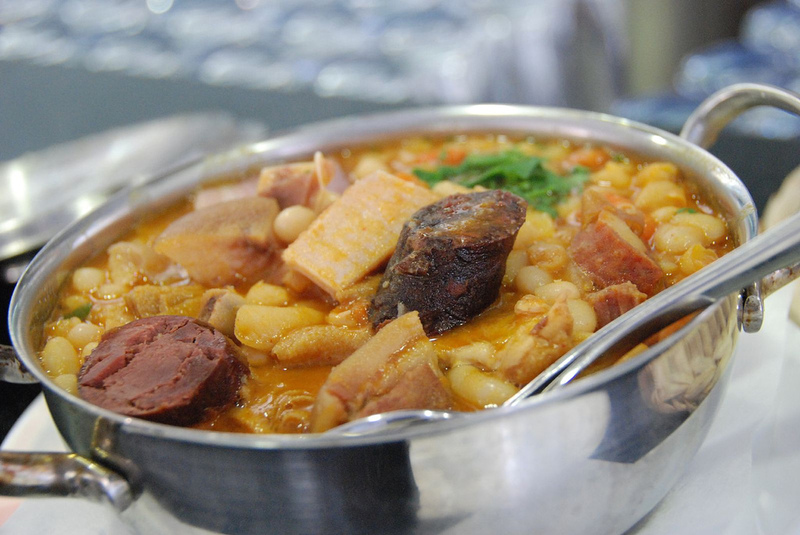 WARNING: Cozido à Portuguesa is one of those dishes that would never win a beauty contest. It’s not alone either—there are many an ugly duckling dishes in Portugal (Açorda, above, also fits the bill as does Tripas and Sarrabulho, below). But NOT judging a book by its cover should definitely apply here, because Cozido especially is layer upon layer of bursts of flavor. 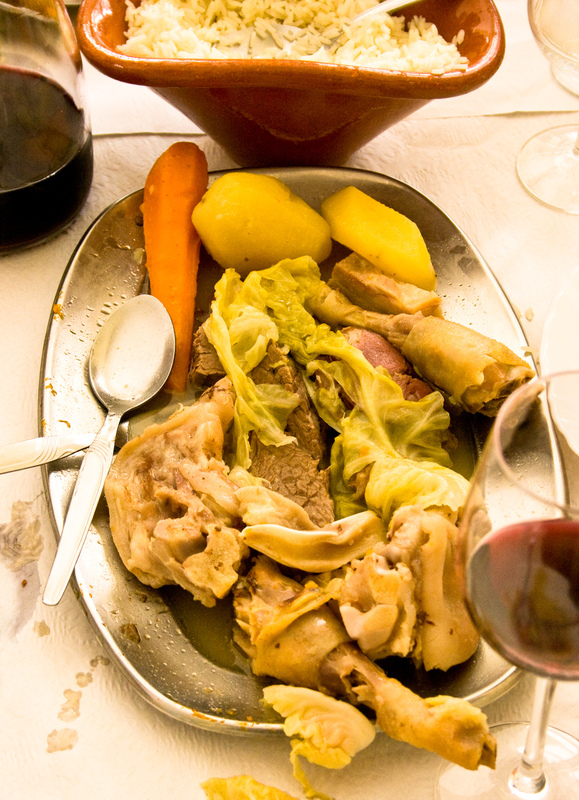 A peasant dish that’s tied to the rural ritual of the Matança do Porco (pig slaughter), it consists of boiled potatoes, cabbage, carrots, meats, pig’s feet and ears as well as a variation of smoked sausages including the Morcela, Chouriço, Alheira and my favorite, Farinheira. The ingredients are all cooked in one pot, added in different stages and at varying temperatures, but always in the same water. The result: confusion! Your eyes will tell your brain that visually … and excuse my bluntness … this looks like garbage. But once that fork touches your mouth, a spell is cast and you’re sure to fall in love with the richness of the dish. The veggies are buttery, the meats and sausage super savory, and the pig’s feet and ears are gelatin fun—not for all, but I’m a huge fan of the cartilagey texture. This is a nose-to-tail enthusiasts dream! 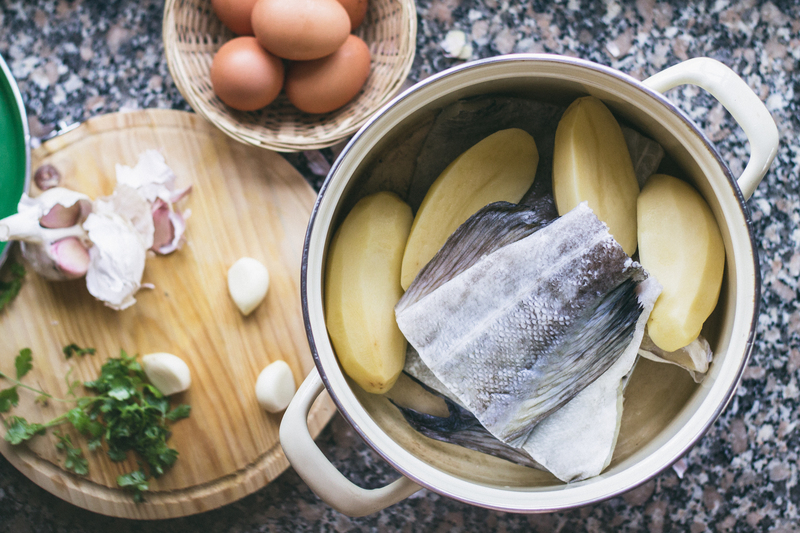 There are more than a 1,000 Bacalhau (salted, dried cod fish) recipes in Portugal’s culinary repertoire. The most common are Bacalhau à Lagareiro (roasted/grilled portions with potatoes and red bell peppers), Bacalhau à Gomes de Sá (casserole of shredded cod, potatoes, caramelized onions, boiled eggs and olives) and Bacalhau à Brás (shredded cod and potato strips fried with onion and scrambled eggs). Because of the salting/drying process bacalhau has an intense flavor that can hook you for life, or be a tad too much. I enjoy it, especially combined with a sweet olive oil that counterbalances the saltiness. A treat are the Pastéis and Pataniscas de Bacalhau (cod fritters: croquettes and patties), perfect to munch on bar-side with an icy brewski. It won’t be difficult to find bacalhau on a menu—it’s served in every region. However, one of my most memorable bacalhau meals in Portugal was at Oxalá restaurant in the city of Ovar, located in central-northern Portugal. The beautiful, thick bacalhau portion was roasted in a sweet olive oil just the way I like it. The ultimate Portuguese soup, Caldo Verde, is a favorite of all ages. Grandmothers swear by it and late-night party people turn to it. Been there … At the wee hours of the morning, a bowl of Caldo Verde and toasty Pão com Chouriço is like a warm embrace. In Lisbon, where the nightlife is vibrant (to say the least!) the spot is A Merendeira. 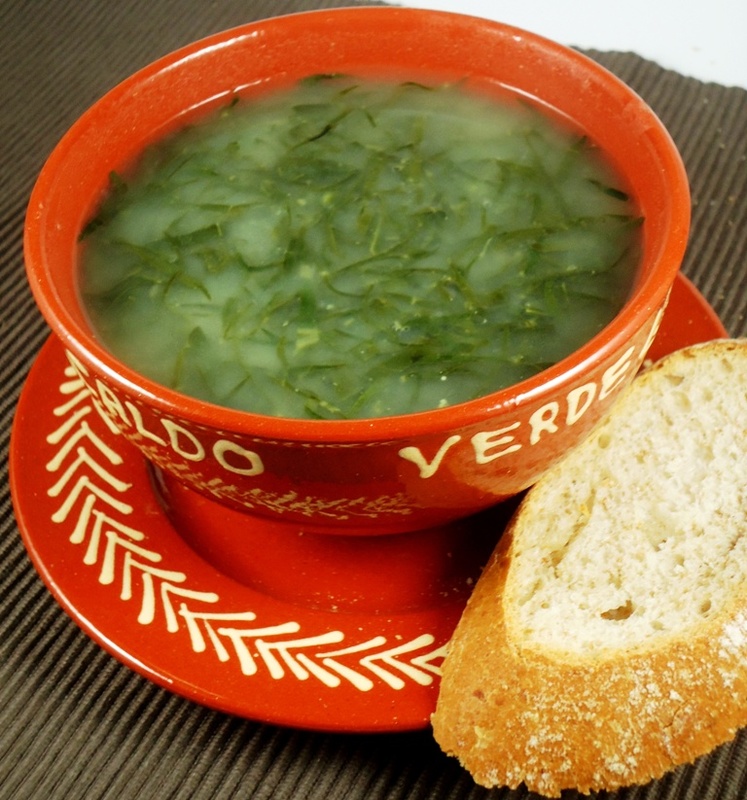 And, Caldo Verde is as much a staple of the country’s June feasts as are sardines. It’s also a favorite of New Year’s Eve celebrations—as soon as the Portuguese are done ushering in the New Year they eat a bowl of Caldo Verde. This soul-enriching soup has at its base potatoes and garlic, followed by shredded kale and rounds of Portuguese smoked sausage, chourico or linguica. It originated in Minho, in northern Portugal, but remains one of the most popular soups throughout the entire country. Though I own several pieces of Portuguese earthenware (barro), used regularly for my roasts, I have yet to own a cataplana. I have “courted” a few on trips to Portuguese shops in the U.S., but in the end none have come home with me. The issue: I have this romantic notion that my cataplana should be purchased in Portugal where I’ll have more options (for varying reasons, that hasn’t happened yet). And preferably in the Algarve, a nod to where this Portuguese cooking tool originated. The Algarve, the southernmost region of Portugal, is fertile with a wide assortment of some of the most delectable fish and shellfish in the country. These succulent sea creatures are thrown into the cataplana to create the Cataplana de Marisco. Shaped like a clam with clasps that ensure moisture doesn’t escape during the cooking process, the food inside (which may include tomatoes, red bell peppers, onions and cilantro) is perfectly steamed, resulting in a dish with eons of flavor. Both the cooking tool—traditionally copper—and the delicious dish are a marvelous creation. 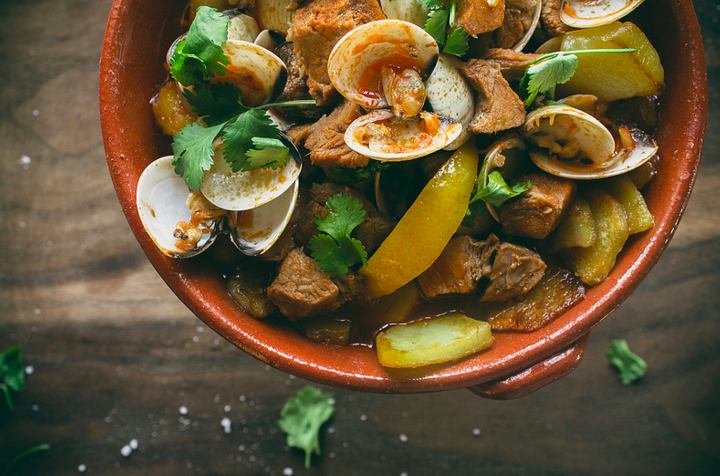 Portugal’s surf and turf duo of cubed pork and clams is one of the country’s most distinct dishes. The meat is marinated overnight in a mixture of white wine, vinegar, paprika, bay leaf, garlic, coriander, salt and pepper, and Massa de Pimentão (red bell pepper paste). Next day the meat is fried in batches. Once the pieces are seared, they simmer in a deep skillet with the leftover marinade and are eventually topped with the clams. As the clams open up, their juices drip onto the pork resulting in a sauce unlike any other—savory from the pork with mineral traces from the clams and finished with the brightness of the cilantro—a staple herb in Alentejo cuisine. It’s served with cubed fries or baked potatoes. You’re sure to find the dish on most menus, but heading to the Alentejo is sure to enhance the experience. Right up there with sardines, octopus is one of the most fished species in Portugal. Since it feeds on other sea creatures living in Portugal’s fantastic waters, you can imagine that what you’re getting is high quality stuff! Polvo is extremely popular throughout the entire country and pops up on menus in a variety of ways—as an appetizer, in salads, in rice, roasted or grilled. I love it either way, but have a hard time passing up roasted. Like roasted bacalhau, it’s nestled in a bed of onions and red bell peppers, drizzled in olive oil and served with roasted, skin-on potatoes that are slightly “punched” (a murro). And like sardines, polvo is available canned too—so enjoy the real deal on Portuguese soil, but remember that cans transport well and may be a temporary remedy for that withdrawal we talked about up top. Since gourmet canned goodies are in vogue in Portugal’s big cities, you’ll have no trouble finding top-notch products. Ordinarily, our minds do not immediately associate tripe with the tastiest of meals. But Tripas a Moda do Porto (named after the birth city of Port wine where this dish has its origins), or Dobrada as it’s known in other regions of Portugal, is something special—especially if you’re a sucker for bean stews like yours truly. Portugal’s bean and chickpea stews are soul food at its best. Take the awesomeness of the rustic flavors we touched on in the Cozido a Portuguesa, above, and pile on a velvety sauce created from onions, garlic, olive oil, white wine, carrots, bay leaves and more … It’s that smooth, soupy sauce that makes me dream of this dish—packed with rustic ingredients full of punch after punch of flavor including smoked sausages, chicken, Mão de Vaca (cow hand—though really foot! ), cannellini beans, sometimes rice, too, and of course, the tripe. The Feijoada, another popular Portuguese bean stew, is also worth a taste. 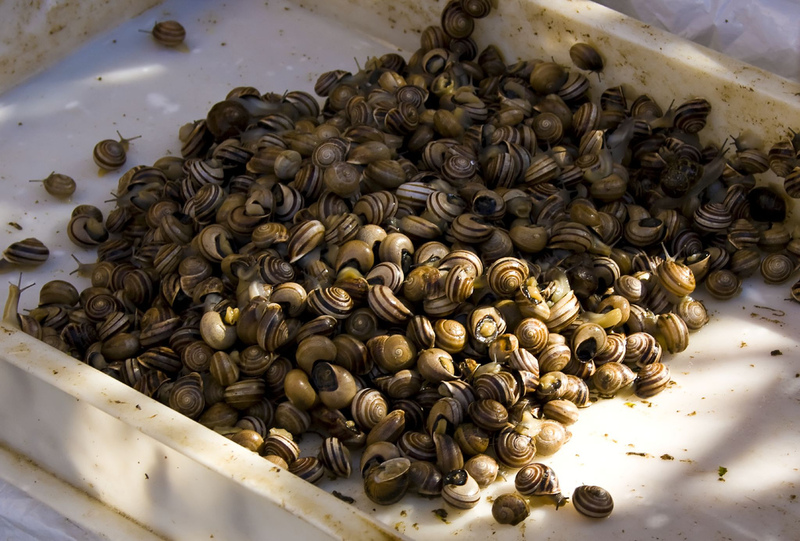 Another staple of the summer months in Portugal are Caracóis (snails). Forget the fancy butter and parsley-smothered escargot of the French, delicious too, but not what I’m talking about here. Portuguese Caracóis (small snails) and Caracoletas (larger snails) are served swimming in a savory (soulful! ), herby broth. Large amounts are cooked in pots and then carried out in bowls brimming with mounds of the slugs for everyone to share as a favorite Petisco—a snack of sorts. Some slurp out the slimy suckers while others pull them out with toothpicks. Whatever the strategy, eating caracois tends to feel more like a pastime than simply sitting for a snack. It’s an association to relaxation, an easy and effortless moment of tasty conviviality, only made better with tall glasses of ice-cold beer. 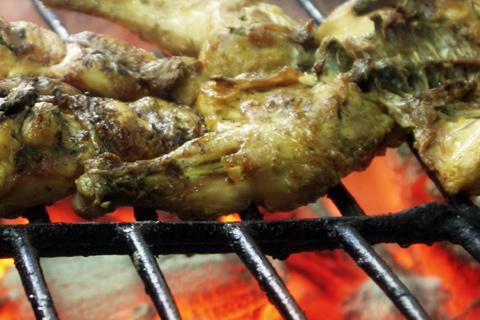 Portuguese barbeque chicken Frango no Churrasco (in immigrant communities also known as Frango Piri-Piri) can qualify as “fast food,” since it’s a quick and inexpensive meal. However, it could never be confused with the likes of your typical processed fast food meal. Frango no churrasco entails marinating and grilling whole chickens (sans breading) on a fiery spit, spiced with a Piri-Piri hot sauce (optional). The sauce—a Portuguese-African concoction—was created during Portugal’s colonial era in Africa, made from birds-eye chilies in Mozambique. Houses specializing in this chicken are called Churrasqueiras and are as ubiquitous as pizzerias in the U.S. The flavorful chicken is generally served with either chips or rice and fries. This is my ultimate picnic food: grab a chicken, a bottle of refreshing Vinho Verde and lay out a blanket. Words will never quite capture the joy I get out of eating wholesome Rojões, the fourth peasant dish on our list. Cuts of boneless pork are marinated overnight in Vinho Verde (Minho’s unique wine), garlic, salt, pepper, bay leaves and paprika. It’s then lightly seared and stewed in the marinade and pig’s blood (don’t let that deter you!). Regional smoked meats, liver, potatoes and chestnuts also sometimes factor in. This would be the most robust version of the meal; there are lighter recipes. Either way, the result is ultra-tenderized meat that turns to threads at the touch. 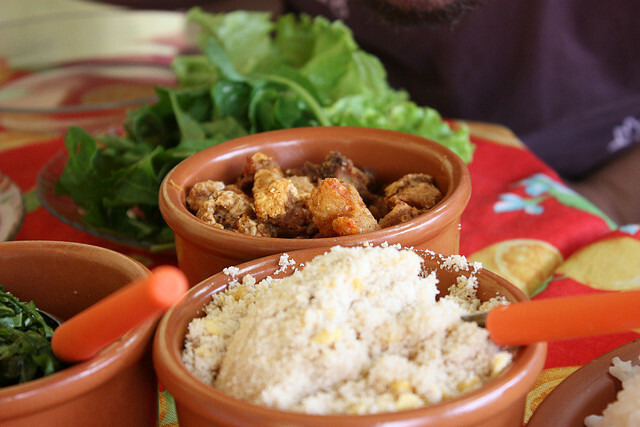 The dish might be served with rice or Papas de Sarrabulho—a paste created from a mixture of pork, chicken, smoked meats, herbs, lemon juice, bread or cornmeal (the recipes varies). Though it’s a northern invention, both Rojões and Sarrabulho (there’s also a rice dish, Arroz de Sarrabulho) are enjoyed throughout Portugal. Though there are several wonderful cheeses worth devouring in Portugal, the Serra da Estrela cheese satisfies not only taste buds but the imagination, too, with a romantic sense of place and character. 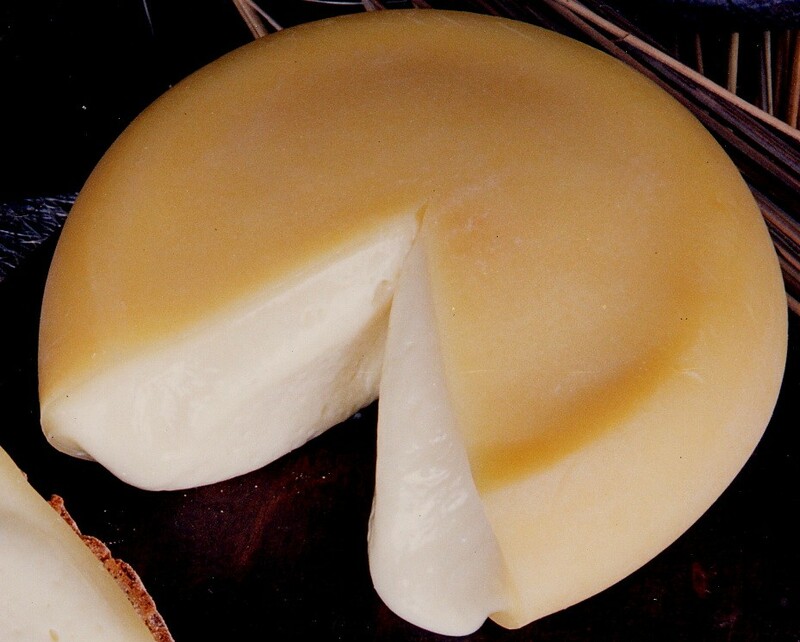 The cheese takes the name of the Beiras-region mountain it derives from, the Serra da Estrela, the highest point in continental Portugal. It’s on this mountain that a (sadly, diminishing) shepherd culture is dedicated to herding the sheep that provide the milk for this cheese. It’s also where the cardoon flower (cardo) that’s added to the milk grows. Throw in there the magnificent sheepherding Serra da Estrela dog—and there’s so much to this cheesy story to love. There are harder and softer variations of the cheese with some gooey ones serving as a perfect tart spread to pair with jams. It’s customary to carve out the top of the cheese round, creating the effect of a bowl from which the cheese can be scooped out with a spoon. A party favorite! Though meals in Portugal are fantastic, they’re never complete for me without a shot of a divine espresso (also a reason to pause any time of the day). Rich and robust, roasted aromas enrapture my senses at nearly every corner when walking through the city streets of Portugal, where cafes abound. Most newcomers are astonished to discover the incredible coffee that Portugal produces and serves—some, if not, the very best in the world. Rewind in Portuguese coffee history and this won’t seem like such a shocker—the history and types of coffee is interesting, read it here. 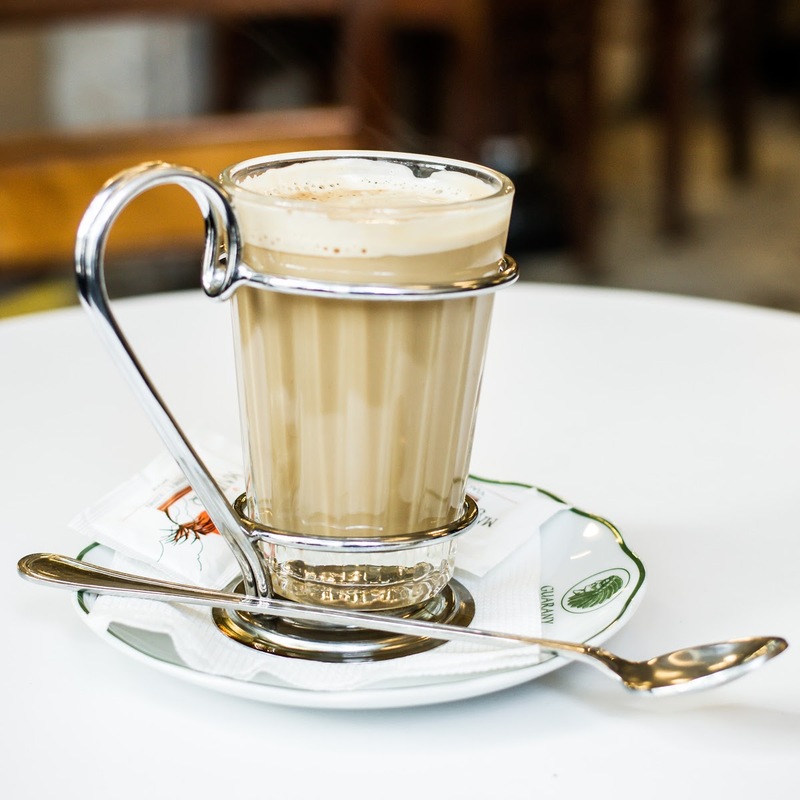 Beyond providing a morning jolt, coffee in Portugal is a reason to stop (and smell the coffee beans), read a newspaper and chat up the person serving it (as a matter of fact, it’s not uncommon to see people enjoying their shot of espresso while leaning against the café’s counter). Lack of good Portuguese coffee definitely puts me in a scary state of withdrawal when I’m back in the U.S. The solution: make it at home! We have a reliable espresso machine at home and buy only Portuguese coffee. We buy Delta Ouro at Seabra’s supermarket on visits to our Portuguese-American community in Newark, NJ, where this coffee is also served well at some of the local restaurants and bakeries. This little custard tart represents Portugal well around the world—I would say it’s one of the country’s top culinary ambassadors. 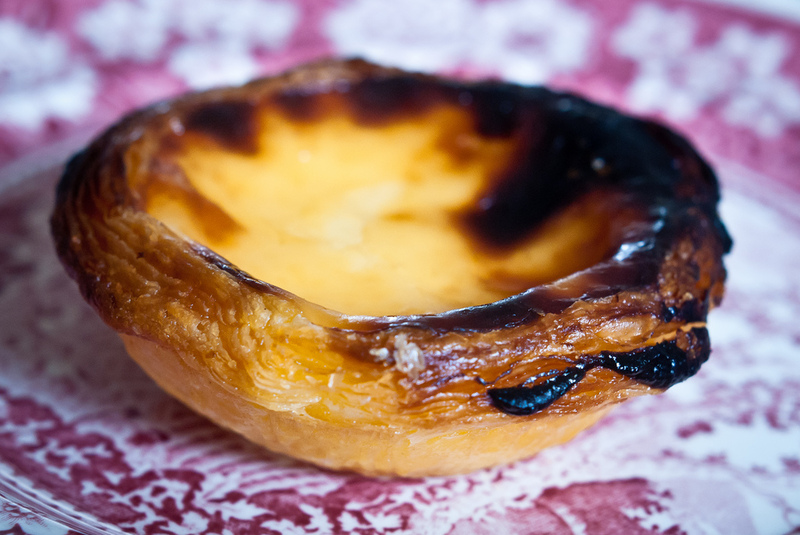 Beyond Portuguese immigrant communities where the Pastel de Nata has been a favorite forever, these eggy, custardy delights (part of Portugal’s “convent pastries”) have lately been making a splash on the streets of London. They’re served out of a vehicle reminiscent of Lisbon’s iconic trams. In New York City, Chef Michael Guerrieri bakes and sells his version at his Italian-Portuguese sandwich shop, City Sandwich. In Portugal, they’re everywhere … In Lisbon, exists one of the oldest houses producing this pastry; it’s located in the neighborhood of Belem. The Antiga Confeitaria de Belém is a favorite of locals and tourists alike. The twist? The custard tarts here aren’t called Pastéis de Nata, they’re called Pastéis de Belem. There are other terrific spots to enjoy these custard tarts—Pastelaria Aloma in the Campo de Ourique is another favorite. The pastries vary slightly from place to place—which means, you’ll be faced with the tasty feat of testing them out for yourself! If you are a fan of liqueur-filled chocolates (I am!) then you’ll love Portugal’s sour cherry liqueur, Ginja, served in chocolate cups. This fabulous duo is the brainchild of the town of Obidos—a mortared, fairytale village that is host to Portugal’s annual chocolate festival where chocolate-themed workshops, sculpting, contests and a bevy of other activities occur. 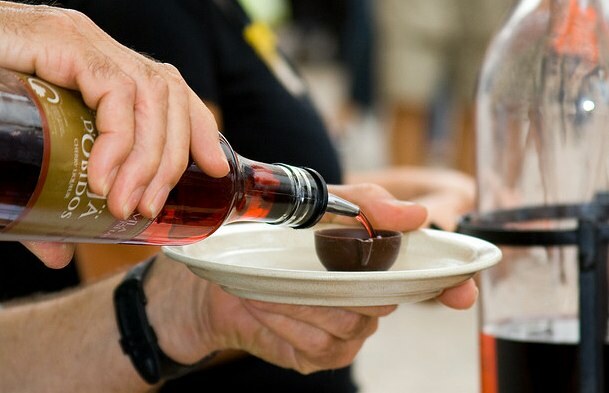 The festival is pure chocolate heaven, but visiting the village is a year-round treat. And on that sweet note, we end our list. Help us grow it by sending us your favorites. Discover the foods of Portugal. Contact us now to book a tour!